If you’re here, then new carpet installation in Lenox Township is what you’re looking for. Here at The Carpet Guys, we provide the best types of carpet at unbelievable prices. We know that buying new carpeting can be a little stressful, so let us make it easy on you. You don’t need to worry about carpet prices breaking your budget anymore. With us at your side, the cost of installing carpet is fair and affordable. Schedule a free in-home estimate with The Carpet Guys and watch the savings roll in. By getting new carpet installed in your home, your rooms gain a sense of warmth and comfort that no other flooring will provide. We want to make sure your carpeting performs at top level and lasts for a long time. When the installation crew arrives at your home, the will begin by removing the furniture free of charge. Once the furniture has been moved out of the room, they will then rip up the old flooring at no extra cost. It is rolled up and placed outside by the curb. Once the old flooring has been taken out of the room(s), new carpet padding is laid out and the carpet is installed on top. They will then take the remnants out of the room and place the furniture back where it was, completing the install. Carpet installation is our specialty, and we guarantee you will love your new flooring when we are finished. To top it all off, we will give you a free lifetime installation warranty when your job is completed. 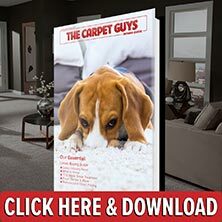 Schedule a free carpet installation estimate with The Carpet Guys today. The best quality carpet will soon be yours.